The International Monetary Fund announced a new $17.5 billion lifeline for Ukraine, which would bring the total bailout package to $40 billion. The new sum would be a four-year program. 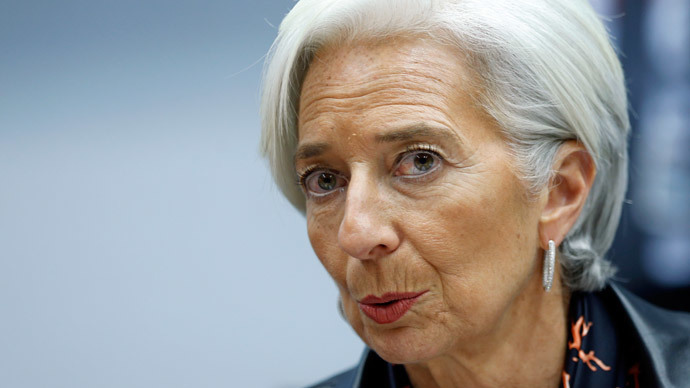 Lagarde will propose the $17.5 billion expansion program to the IMF by the end of the month. "The program is not yet approved by the governing council. I hope to offer it for approval by the end of February," she said Thursday. "This new four-year arrangement would support immediate economic stabilization in Ukraine as well as a set of bold policy reforms aimed at restoring robust growth over the medium term and improving living standards for the Ukrainian people," Lagarde said in a statement. In return Ukraine will have to present a “program of deep economic reforms,” which includes the whole economy and a plan to transform Naftogaz, Ukraine's state oil and gas company. “It’s a large program, it’s a longer-term program than the previous one, which was a traditional SBA [Stand-By Arrangement] for two years,"the IMF chief said. “It’s ambitious, it’s not without risk, but we believe it is a realistic set of macroeconomic framework, ambitious reforms, but reforms the authorities feel confident they can deliver,” Lagarde said. IMF head Christine Lagarde didn't answer the question as to whether the four-year international bailout program for Ukraine included credits from Russia. Earlier this month, the US promised Ukraine as much as $2 billion in loan guarantees, while the EU said it would disburse €1.8 billion ($2.1 billion). Ukraine’s Prime Minister Arseny Yatsenyuk stressed that the new bailout program would open sources for Ukraine to get help from other international organizations and partners, making the total sum thus $25 billion. He confirmed the commitment to reforms that will stabilize Ukraine’s economy and finance. The country’s game plan includes fighting corruption, settling the energy sector, as well as cutting and optimizing state expenditure and increasing investment to 3 percent of the GDP, Yatsenyuk explained. “Stabilization of the banking system and the exchange rate are also the goals of the program,” Yatsenyuk said. “Recovery in confidence in Ukraine through the adoption of the 4–year program will be a major factor in the stabilization of the exchange rate, and an objective and strong banking system of Ukraine that will give the opportunity for Ukraine’s economy to develop,” he added. Yatsenyuk said the government is also going to provide extensive assistance to low-income households. By the end of the year he expects it to include income indexation linked to the level of price rises. He also said the IMF program will provide $500 million for low-income families to help pay for increased energy bills.